it is a technology that you can feel comfortable about. Geo-Exchange is considered by the "EPA and Dept. 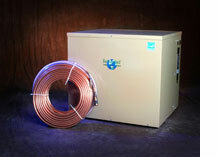 of Energy as the greenest" and most environmentally responsible heating and cooling choice available today. capacity of the ground as a renewable energy source for our homes and businesses is the most reliable choice to lower your energy bills and our dependance on fossil fuels both regionally and from foreign sources. Choosing the right comfort source for your home is one of the most important decisions you can make for your family's comfort and its budget. The factors most valued in determining that choice are Efficiency, Comfort and Reliability—the call-letters for ECR Technologies and it's EarthLinked® Direct GeoExchange System. The EarthLinked® System excels in meeting each of these needs through innovation in renewable energy technology. This proven system substantially cuts monthly energy bills. It also quietly delivers peace of mind. It improves humidity control and the quality of indoor air by eliminating the combustion of fuels and its byproducts, including carbon monoxide. Greater air filtration results from longer run cycles as compared to other space conditioning methods. Without combustion, there is no explosive hazard, no flame, no fumes and no emissions. You can rely on ECR's EarthLinked® System for low-maintenance and high efficiency heating and cooling. It offers you the most comfortable living environment and ensures a long life of cost savings, energy conservation and reduction of greenhouse gases and other harmful emissions. The EarthLinked® System's earth loops enable direct exchange of thermal energy with the earth. Standard refrigeration tubing is used because of its high thermal conductivity. The DIRECT AXXESS® earth loops are designed in three different configurations (horizontal, vertical and diagonal) to meet most new and retrofit applications. This allows for the selection of the most economical loop configuration for each installation. DIRECT AXXESS® Earth Loops are factory assembled so the installer does not need the plastic fusing tools and long cumbersome pipes required for a water-based loop system. They are factory pressure tested to assure the highest quality standards. Loops using vertical or diagonal bore holes are typically installed in less than two days. Horizontal loops can be installed in a single day. ECR loops are easier to install because they use a much smaller bore hole and less excavation than water-based systems. 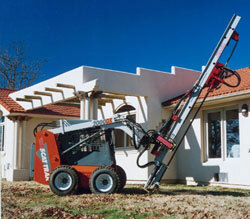 Therefore, smaller and more maneuverable drilling equipment can be used.